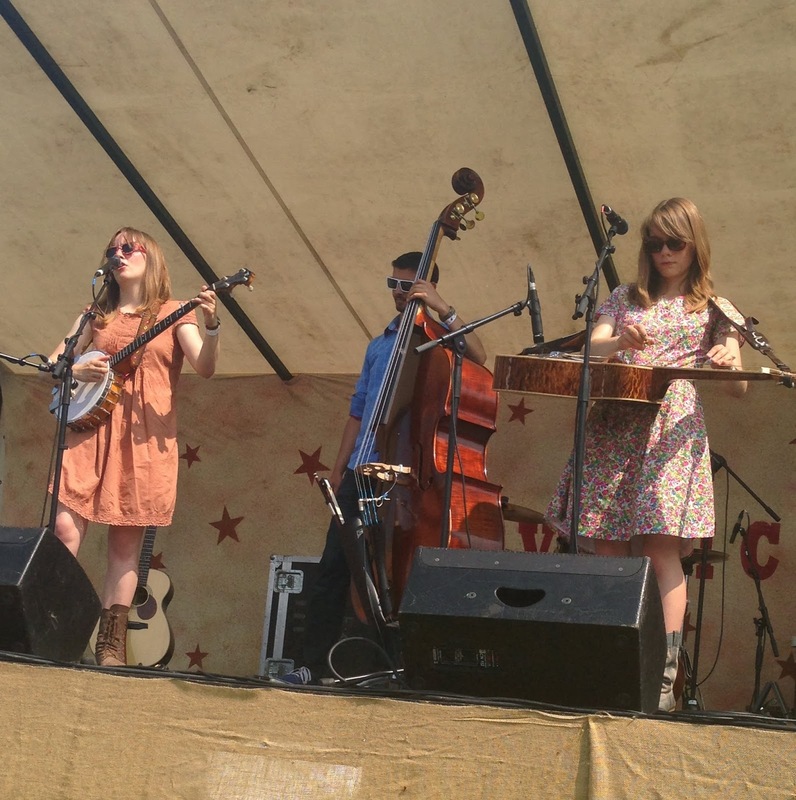 In the week that saw the Americana music industry re-convene in Nashville, Tennessee for its annual get together, it is intriguing to think how connoisseurs of old time Appalachian music would take to UK folk/bluegrass duo The Carrivick Sisters. Multi-instrumental sibling harmony acts are at the core of this style of music stateside and these two ladies from Salcombe, Devon would be able to stand shoulder to shoulder alongside some of the highly rated artists responsible for the old time revival. Catching them for the third time this year, albeit in different formats, has confirmed their undoubted potential and the setting for this well attended Monday evening gig at Henry Tudor House in Shrewsbury was ideal for the preview of their upcoming album OVER THE EDGE. Charlotte and Laura have been steadily acquiring new admirers in their relatively short career to date due to an innate ability to merge the influence of traditional folk with a sound leaning very heavily on the acoustic combo of fiddle, mandolin, banjo and Dobra. On the evidence of this return to a town fast becoming a real hub for UK folk music, many more followers will surely be joining the growing band of Carrivick Sisters’ fans. Spread over a pair of synchronised sets, they interspersed originals from both their most recent and upcoming new albums with some carefully selected covers that acknowledged their wider interest in music from across the pond. There was no holding back their enthusiasm for Alison Krauss with a version of ‘Gentle River’, as well as the usual opening question of asking for the audience’s approval for a little bit of James Taylor before launching into ‘Sweet Baby James’. A Norman Blake song recorded by respected US bluegrass maestro Tony Rice ‘Church St Blues’ always sees the sisters test the audience for a little artist recognition which is usually met by the odd approval. While these covers along with renditions of traditional songs ‘Darling Cory’ and ‘Lazy John’, provide a sense of artistic interpretation, the soul of The Carrivick Sisters exists within their perceptive aptitude to compose and deliver impressionable original content. ‘If You Asked Me’, ‘The Moon’ and ‘Over the Edge’ all did a fine job of whetting the audience’s appetite for the new album and enthusiastic participation adds an element of variety to the infectious ‘Today is a Good Day’ from 2011’s FROM THE FIELDS. 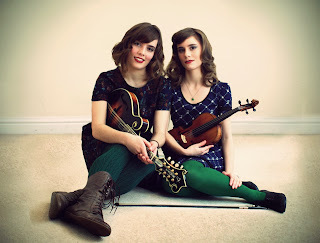 The between-song stories and banter which help fills the interlude required to ensure the precious instruments are precisely tuned is a developing aspect of a Carrivick Sisters’ show but it certainly adds value with personal anecdotes, observations and the sources of their song writing inspiration proving informative and valuable. Whether in harmony, solo or duet format, the crystal vocals created a sense of awe amongst those present as well as an unavoidable desire to marvel at the expert playing of Charlotte on guitar, mandolin and banjo while Laura excelled on fiddle and Dobra. By the time they closed the show with their self composed instrumental ‘Piggy Bank’, vaunted approval circulated the air of this lofty venue and left the audience eager to sample more of the new album. 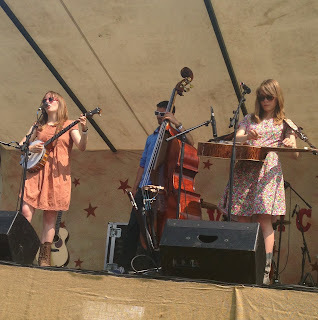 The Carrivick Sisters are a band worth checking out whether your core interest resides in folk music, bluegrass or Americana and there will no doubt be many more opportunities to see them live as the new release gathers momentum. Maybe the chance will arise one day for them to show a wider audience that transatlantic crossover music is healthy and vibrant on our isles. You never know ‘Briticana’ could yet emerge to rival ‘Americana’ especially as the talent pool is plentiful.